The Matchless Silver Hawk was created during the Great Depression. Although finances were tight, Bert, Harry and Charlie Collier wanted to incorporate cutting edge technologies in the new Matchless luxury models. 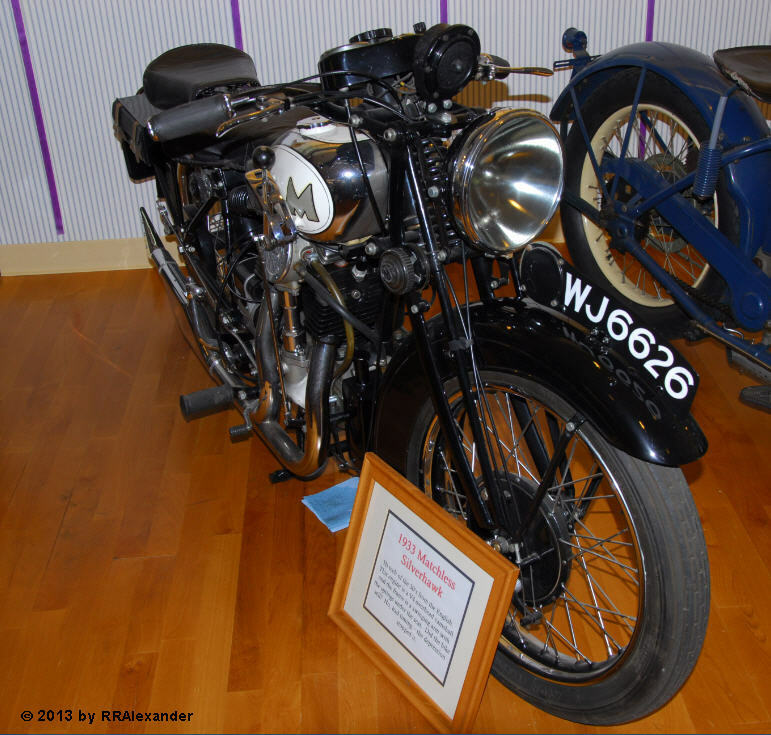 Single cylinder motorcycles had dominated the British motorcycling scene for years, but multi-cylinder motor bikes were beginning to come into their own. 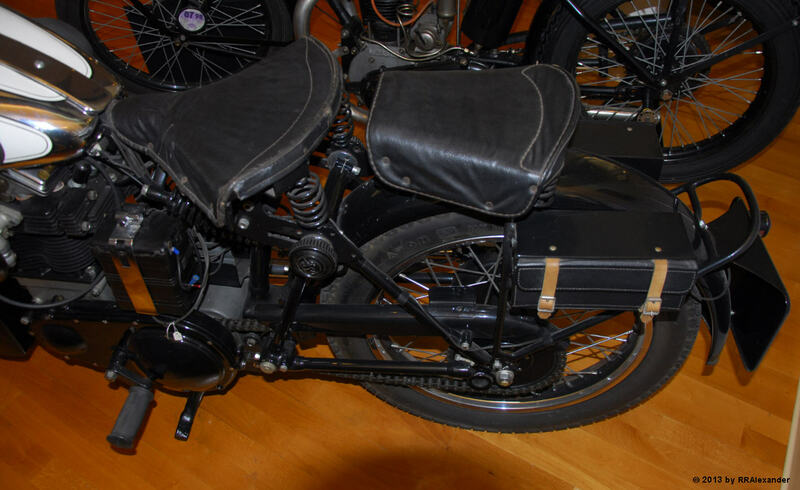 Any motorcycle with two or more cylinders was considered to be somewhat daring at the time. Keeping pace with the 500cc square four built by Edward Turner at Ariel, Matchless built the 400cc V-twin Silver Arrow, then the 592cc four-cylinder Silver Hawk. The Silver Arrow wasn’t a huge success, but it introduced features which were later used on the Silver Hawk. The Arrow was quiet and comfortable, but not fast, and it sold slowly. Matchless decided that a model with greater speed was called for, and the V4 Silver Hawk delivered that speed. It had a 592cc, 26bhp engine capable of attaining 85mph, and a cassis and suspension to match the additional speed of the engine. The new engine was basically two narrow angle V-twins mounted on a single piece block. A single piece cylinder head contained a bevel-driven overhead camshaft. Fuel was delivered to the combustion chambers by a single Amal carburetor The oil tank was bolted to the crankcase at the front of the engine near the single frame downtube. The primary drive chain was housed in a oil bath, and the final drive was via chain. The four gears were selected by hand. The Silver Hawk suffered mildly from overheating, though not as much as Ariel’s Square Four. 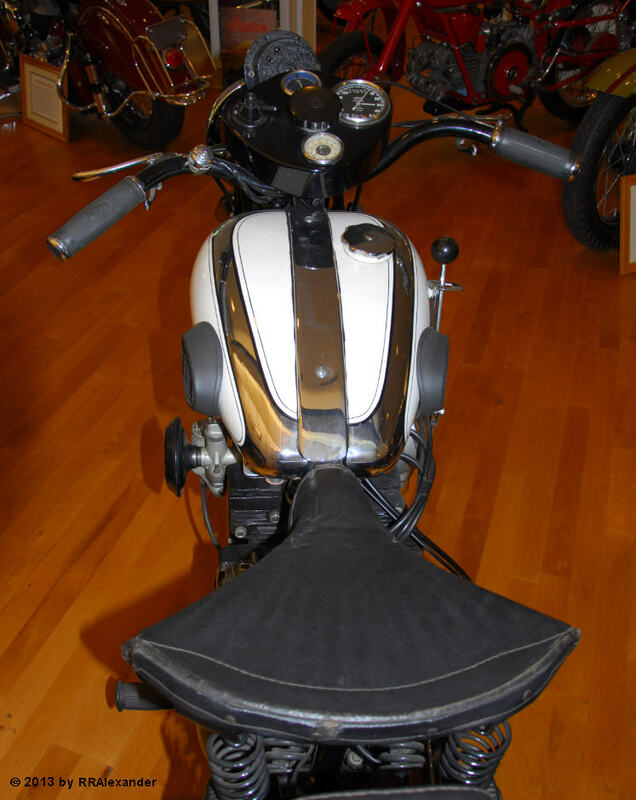 The ingeniously spring saddle, along with the adjustable girder front end provided a very comfortable ride for the time. Unfortunately, only 550 Silver Hawks were sold between 1931 and 1935. The low sales figures can be attributed to the worldwide economic depression. The majority of the customers for whom the luxury Silver Hawk was designed simply could not afford it at the time. 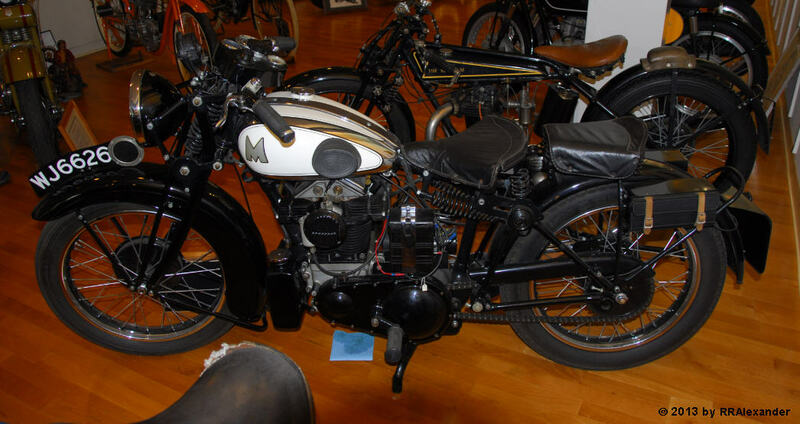 The 1933 model shown here is in the Vintage Motorcycle Museum in Solvang, California. Photographs were made with a Nikon D200.